Enjoy watching the Tui feeding in our garden. This is a safe fenced garden in a quiet location so close to town .The house is double glazed and the sun pours into the rooms. Travelers enjoy the fully equiped kitchen and stylish dining area and comfortable lounge. Sky TV and Internet are free to you . One set of bed Linen , towels , face cloths and bath mats are free to you so a home from home experience ! The beds are all new as we understand the importance of a good nights sleep when travelling ! We expect people to only use one set of bed linen please if all the beds are made up to give you choice. Bedroom 1 There is a queen bed. Bedroom 2 , a king bed that on request we can split into two king singles. Bedroom 3 A king single that has a roll out bed if requested . There are puzzles and games for the family to enjoy. There is a BBQ ready for those warm evenings. .
Te Anau is waiting to show off to you the unspoilt splendour of Fiordland. Here is the wow factor previously reserved for Queenstown ! Enjoy the seclusion of the varied recreational activities such as walking the Great Walks , fishing or Golf. For the thrill seekers take a jet boat ride into lord of the Rings country or a family trip across the vast lake to the Glow worm caves. Its only 2.0 hours to Queenstown and the ski fields or the huge number of activities around it. Of course Te Anau is the gateway to stunning Milford Sound and stopping here for two nights or more enables you to enjoy the stunning surroundings . Only 100m away is the friendly Te Anau Country Club. Non Members are welcome to enjoy delicious great value meals from the Restaurant. Take away meals are also available. If it is raining there is a unique vintage machinery museum 5 minutes walk away open most days in the year ! Note the cleaning service we provide is included as washing the linen and towels , the toilet, bath and shower . We expect the house to be left as it was on your arrival eg your cooking utensils and dishes all washed with the floor area luxed ( vacuumed ). If you wish to take the cleaning option as an extra charge this will be $70.00. it is assumed that you only use one set of bed linen and towels provided . Above this there will be an extra charge of $10.00 /pp/ stay. Gordon was born in England and married Viv from North Canterbury settling in Southland 1994. We have traveled back to UK many times with our two kids who are now overseas continuing their adventures ! We understand your travelling requirements and have worked hard on making this and our other property ( 34 Breaksea st Te Anau . Code 20036757)the perfect relaxation house after the days travel ! This property is in a very convenient and quiet location and being able to wander down to the amenities was an important factor. There is everything close to you and be it the Milford Highway or the roads out to the Great Walks and Manapouri . The cycling trails are now up and running and offer this option to smell and see the fantastic native bush, fresh water and mountains around this area. So close to this lovely fiordland town and the many outdoor activities centered from here . The house has now been double glazed as we understand warmth is important . All new confortable beds. All day sunny veranda and sheltered garden with Tui birds feeding from our feeder. A seperate shower in the bathroom with a seperate bath as well . VERY good water pressure ! Heat pump and radiator in the hall. It is expected that guests only use one set of linens and towels per stay . There would be the facility to have a change of linen over more than a 5 night stay . Please park in the driveway of the house . Extra parking is out on the quiet road please. open plan with dining area and kitchen. We have offered a full range of dishes and utensils. Very clean and comfortable. Fully fitted kitchen with everything you need. Quite possibly the best shower in THE world! A very beautiful home, fully furnished in a convenient location. Nothing negative to say. Really enjoyed the stay here in Te Anau. 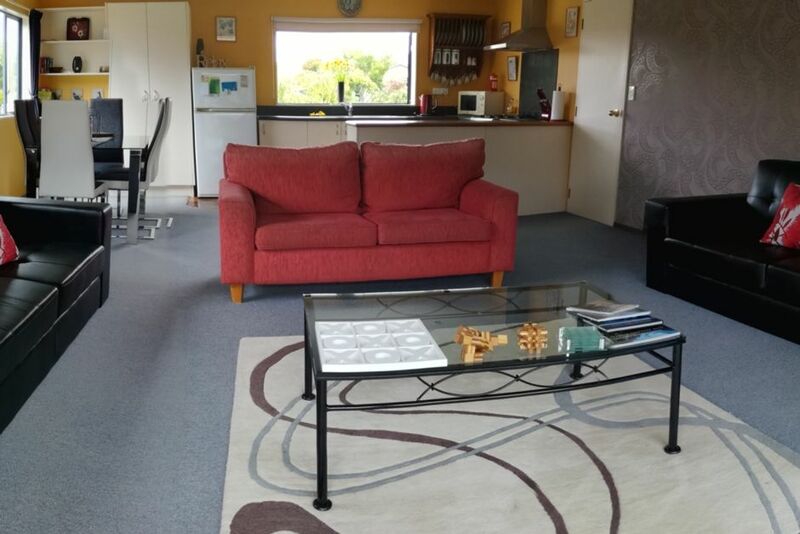 This is our best accommodation in NZ. Owners really helpful, right down to the local coffee discount card. Just loved it. This home was everything we expected and more. It was clean comfortable and warm. It was the ideal base for a stay and have a look around the area. It was very handy to the township and the local pub where we had a wonderful meal. The trips to Milford and the glow worm caves were well worth a visit and Real Journeys are the people to book the tours with.